Skiatook, known as the "Gateway to the Osage", is identified with rolling wooded hills, recreational Skiatook Lake, and one of the great expanses of tall grass prairie in the country. The town has grown steadily since its beginning in the late 1800's. Over the last three decades the population has had at least a 35 percent increase per decade. 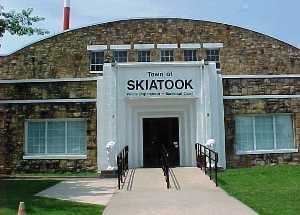 In 2010, Skiatook's trade area population was estimated to be around 26,700. Skiatook residents are only minutes away from Tulsa and Bartlesville. Within five miles is Skiatook Lake, one of Oklahoma's most scenic recreational lakes offering fishing, hunting, skiing, sailing camping, scuba diving and swimming. In addition to Skiatook's great schools, churches, businesses and civic organizations, Skiatook offers the convenience of a city, with small town comfort and friendliness. Average Annual Temperature: January, 47 degrees; July, 84 degrees. Fire Department: Full time with chief and firefighters, plus volunteers. The Fire Department also operates Emergency management Service. Osage Railroad Co.; Motor Freight Carriers (located in Tulsa); Federal Express and United Parcel Service; Port of Catoosa (25 miles). Skiatook Municipal Airport, runway length 2900 feet, asphalt runway surface, fixed base operation. Nearest commercial airport - Tulsa International Airport (12 miles). Skiatook Lake, World's Largest Statuary, Skiatook Museum, Antique Shops, Healing Rock, Civil War Battle Marker, Captain's Cemetery, Hillside Cemetery, View from Javine Hill, Horse and Cattle Ranches, Skiatook Airport, John Zink Boy Scout Ranch, Oklahoma Farrier's College, Herbert Pinc Auditorium, Vegetable and Fruit Market, Pecan and Flower Market, Community Building, Cedar Crest Golf Course, Cross Timbers Marina/Resort/Golf Course, and Crystal Bay Marina. Inspect before you buy your dream home. Please let us know of any additions or changes.